The Volvo C30 electric car is going into testing and evaluation by customers this summer, and features faster acceleration and faster charging. Volvo has upgraded the electric Volvo C30 with a more powerful drive train, and more powerful charging system. The upgrades offer better performance on the road, and a greatly desired reduction in charging time thanks to a 22 kilowatt charging system. The Volvo C30 is the company's concept electric car, and beginning in the summer of 2013 some European Volvo customers will be driving and evaluating a fleet of 100 electric C30's. The upgraded C30 is powered by a Siemens electric motor that has a peak power output of 89 kW (120 hp) and a torque of 250 Nm, and offers an acceleration of 0-70 km/h in 5.9 seconds. 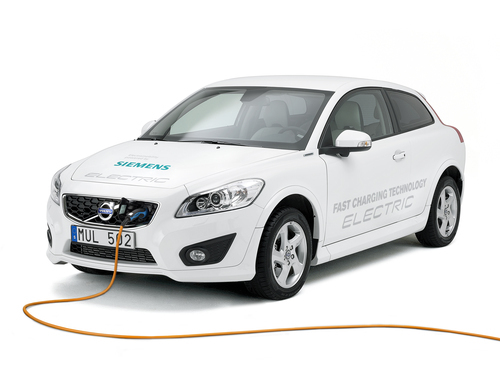 Siemens and Volvo have been collaborating since August 2011 on a scalable family of permanent magnet and asynchronous motors for electric vehicles with continuous power rating from 30–80 kW. The Scalable Product Architecture (SPA) platform, is slated to enables electrification at all levels of Volvo's product family, from different kinds of hybrids to pure electric drive. The 22 kilowatt three-phase AC charging system is supplied by Brusa. It enables the Volvo C30 electric to have fast charging capability without requiring an expensive external fast charging station. In Europe, 3 phase AC power outlets are common making it possible to get fast charging in lots of places. With an ordinary single-phase 240 volt outlet the charging time is 6-8 hours. "Adding the innovative fast charging solution will radically improve the time and mileage for the daily usage of the car. This will drastically improve the cost of ownership since the customer will now be able to drive many low cost kilometres per day. A quick 10-minute plug-in adds power for another 20 kilometres of driving," says Lennart Stegland, Vice President Electric Propulsion Systems, Volvo Car Group. "We're proud to have developed this unique solution. By offering more usable hours a day, we've taken an important step towards making electric cars more viable as a commercial proposition, in both the private and public sectors," Lennart Stegland says. "Our aim is to be first with the latest technology within electrification. The new C30 Electric fleet will give us continuous feedback on technology and functionality as we approach a future series production," Stegland says.